It’s some honor captaining a professional football team. When that team is Manchester United, then it’s very special indeed – especially when the person leading the team out in front of almost 70,000 fans at Old Trafford is an Asian player. Park Ji-sung has achieved pretty much all there is to achieve in the game, but the South Korean took the armband for a crucial Europa League tie against Ajax of Amsterdam. The English powerhouse actually ended up losing to the Dutch team, who won a hat-trick of European titles in the early 1970s, 2-1. But due to the team’s 2-0 win in the Netherlands in the first leg, it’s Manchester that continues to the next round. While the game won’t live in the memories of most fans, it has been well-received in Korea and Asia. The number of Asian stars in the big leagues of Europe may be growing, but it’s still small. And it’s almost unheard of for them to be captaining teams. It was a proud moment. 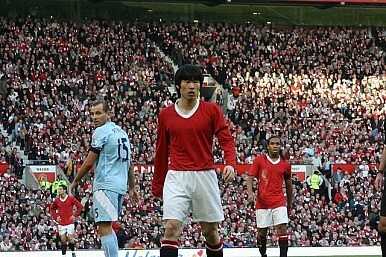 Park is still the most famous Asian footballer in the world, having joined United from Dutch stars PSV Eindhoven in 2005. Since then, he has helped the English club lift four English Premier League titles, one Club World Cup and one UEFA Champions League trophy. He became the first Asian player to appear in that tournament’s final in 2009, when United lost to Barcelona. Earlier this month, Park made his 200th appearance for the club, not bad when you consider the number of injuries he has had and the fact that when he was bought almost seven years ago, cynics sniped that he had been signed more for his ability to sell shirts and attract fans in East Asian markets, rather than his ability with a ball at his feet. He has done it time and time again.